Every day thru Thanksgiving – Target is offering up an opportunity to save up to 40% Off a different kids’ item with Target Cartwheel. 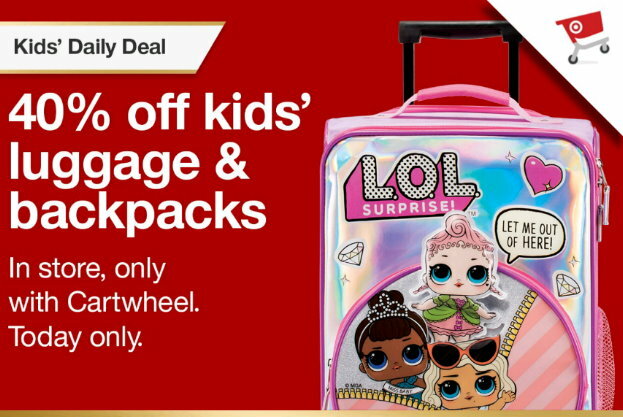 Today’s offer is for 40% Off All Kids’ Luggage & Backpacks and it is valid today only, 11/17 both in stores and online at Target.com. If you are ordering online the cartwheel can only be used when you add the cartwheel first, and then choose Drive-up or Free store pickup if available. This cartwheel also has a limit of 10 per guest, which means you do not have to split up your transaction if you are buying more than 4. This particular cartwheel will apply to up to 10 items in one transaction.